Emstrument Demonstration Video from Signal Narrative on Vimeo. Emstrument [emulator + instrument] is an experimental open-source Lua module which can be used to be convert retro games into new musical instruments or interactive musical compositions. Using an emulator that supports Lua scripting, in-game events can be used as triggers for notes and controls to manipulate sounds. It's basically a mod for your virtual game console that adds connectors for your audio gear. Emstrument outputs standard MIDI for simple integration with existing digital music workflows (or even MIDI-compatible DJ software). Emstrument is the inverse of the "chiptune" genre of music. 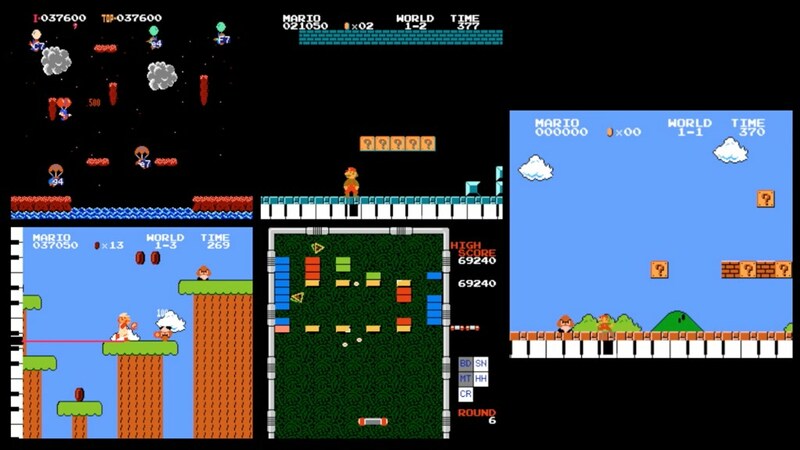 Chiptune music is produced by taking the sounds from a game and arranging them using traditional musical interfaces (keyboard, sequencer, etc), which means the game is taken out of the musical equation at an early stage. By contrast, Emstrument uses the user interaction, algorithms and design of the game as a musical interface to control any kind of sound, highlighting the game itself. However, they are not mutually exclusive; Emstrument can be used to generate chiptune sounds, bringing the whole game-music relationship full circle. Emstrument allows musicians to use games as a new kind of instrument, using interactions and algorithms/data from the game to manipulate sound in new ways that cannot be recreated with traditional musical interfaces. The visual component also adds a new dimension to the music, which allows non-musicians to better understand the musical concepts at play. These instruments create a new kind of gameplay where you not only have to succeed at the game, but play "musically" (follow a rhythm, play in key, etc). Emstrument is not limited to controlling one instrument at a time; it can be used to create interactive full musical compositions that are influenced by the player's in-game choices. These compositions can be standalone audiovisual pieces, or can be a replacement for the primitive scores and sound effects found in retro games, creating a new way to experience an existing game. These compositions fit into a new category of generative music called inter-algorithmic composition (IAC), since the composer creates algorithms that interface with the algorithms already present in the game. Emstrument is a module for Lua, a simple scripting language that is easy to learn for anyone with coding experience. It deals with MIDI hassles like timing and avoiding redundant messages under the hood to let users concentrate more on the music. Scripts are not limited to what's in the game, since emulators with Lua support generally have a Lua API for drawing on the screen, loading save states, etc. which can be used for augmented visuals or for loop-based music, respectively. Scripts that convert a game into a musical instrument can be written in well under 100 lines of code, and a generative score for a game can be done in a few hundred lines. Emstrument has been tested with Logic Pro X, Ableton Live and GarageBand, and should be compatible with any CoreMIDI-compatible software.